The coroner concludes that Great Uncle Percy’s death was accidental; he’d tumbled off his hunter during the fox chase. 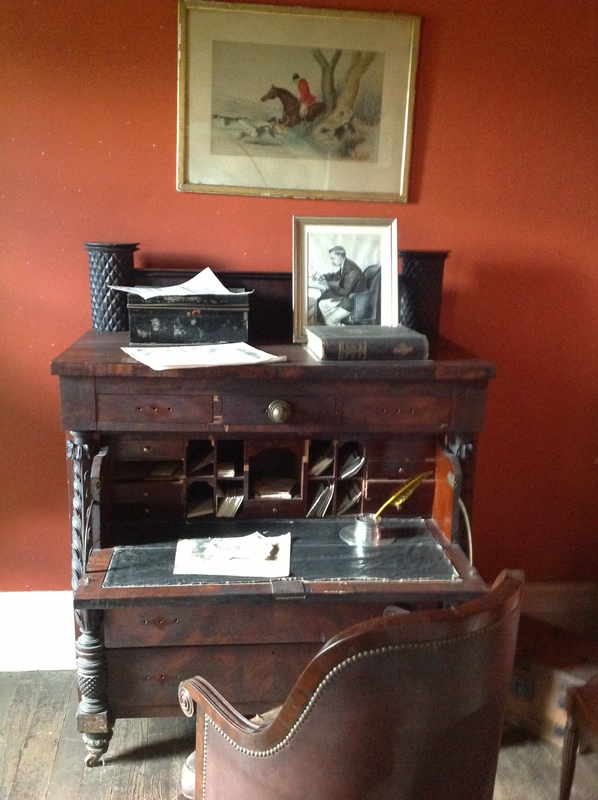 Nobody has cause to doubt the ruling; not, that is, until it’s discovered someone has rifled through his bureau, undoubtedly in search of the secret drawer and its rumored contents. Suspicion falls on my cousin. He’d recently argued with Uncle Percy who’d denied his demand for cash. Closer examination of the hunter’s broken girth strap reveals it was almost sliced through with a sharp implement. I dawdle by the koi pond; my penknife sinks beneath the murk. Very clever Di. enjoyed it immensely. You are really good at this FF. You probably noticed that this story was pretty much all ‘telling’ Marg. At present, the writing style isn’t my main focus. Rather, it is the ideas that the photo inspires that I’m interested in. (oops – ended a sentence with a preposition.) Really appreciate your feedback, thanks a million. Clever little story. Nothing wrong with the telling here; you show us whodunnit. What was in the (not so) secret drawer? I want to know. Thanks very much for your feedback. It’s much appreciated. What was in the secret drawer? Ahhh … something to tempt murder, methinks. Now you’ve really got me wondering what was in the drawer and what happened next….? Perhaps you can pick up the tale from here and complete it, Charmian? I’d love to know how it ends! Thanks for dropping by and leaving a comment. Colonel Mustard did it with a penknife. 😉 Nicely done. I really enjoyed this…a full story in 100 words that still has so much to tell. Good job! Thank you, Grace, for your positive feedback. Blame it on the cousin and make a clean get away. Well done. A clever murderer would have used a bit more imagination when concealing the weapon. I fear those koi will not be so coy in coming forward. Definitely the black sheep of THAT family! Now that is a great point, Susan – the narrator could be protecting someone. Love murder mysteries with a good twist. Than you for your feedback. Great story Di! the thought of that knife sinking into the pond sent chills up my spine!